Austin Boulevard’s dividing line between Oak Park and Chicago’s West Side is the subject of a new play debuting this month at the neighboring suburb’s high school. 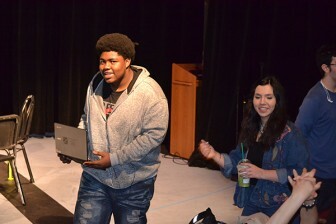 Students at Oak Park and River Forest High School will debut “Crossing Austin Boulevard” March 17-20. The students and their teacher, Avi Lessing, have been in rehearsals for the last month. The play features both acted-out scenes and monologues, with a focus on Oak Park’s housing integration efforts beginning in the early 1970s. The play will also look at how street boundaries like Austin Boulevard keep communities separate rather than bring people together. 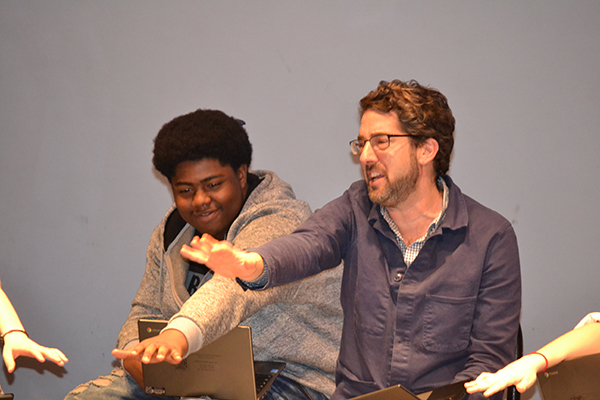 “The students have become really interested in telling that story,” Lessing said during an afternoon rehearsal at OPRF, 201 N. Scoville. About two-dozen students are involved as actors, writers, set designers and marketing the production. Incorporated in 1902, Oak Park began a concerted effort to promote integration through fair housing programs in the late 1960s and early 1970s. “As a teacher, I didn’t know about Oak Park’s intent at integration and the Oak Park Housing Center,” said Lessing, who’s taught English at the high school since 2003 and been its theater director since 2005. “When we talk about boarders – those invisible barbed wires – what’s the different between integration and diversity, and what do we mean by integration?” he said. Austin Boulevard, the boundary between Chicago and Oak Park, has been the focus of other recent artistic works. Logan Square resident and Chicago public schoolteacher Jeff Ferdinand’s book, Austin Boulevard: The Invisible Line between Two Worlds hit bookshelves in October 2016. It looks at racial and economic disparities between Chicago’s black and white residents, and also explores Oak Park’s history. Lessing said he’s reached out to Ferdinand about the book. For the last several weeks, Lessing’s students have researched Oak Park’s history, looking through school archives and talking with longtime residents involved in the initial housing movement. The students have developed their scenes from that research. Lessing said some form of audience interaction might also be included in the performance. Sydney Jackson, an OPRF senior, has been promoting the show on social media. A dancer and community volunteer, Jackson, 18, said the play can help get people talking about these important issues. Crossing Austin’s boarder into Oak Park is something OPRF senior Jalen Reese experienced recently. The 17-year-old enrolled late in the semester this past October. Two of his teachers encouraged him the join the production because of his story. The Chicago native said he had a hard time adjusting to middle-class Oak Park and the high school’s diverse campus. “I felt like I really didn’t have a place here,” said Reese, whose grandmother lives in Oak Park. Still learning to adjust to his new school, Reese has had some highlights, including earning Student of the Quarter in English. Reese said he’s comfortable sharing his personal story in the play. And after some initial nervousness, Reese has settled into rehearsals for the play, interacting more with his classmates. Mayor Rahm Emanuel and Chief Garry McCarthy announced this week that applications for new officers are due Dec. 16, and the entrance exam will be given in February.